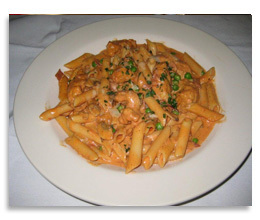 Try one of the 466 pasta and italian specialties. Have the Four66 cater your next function. Sauteed chicken breast in a Madeira wine sauce with mushrooms then topped with asparagus sprigs and oven melted mozzarella cheese, served with mashed potatoes. Sauteed chicken breast with sun dried tomatoes, mushrooms caps asparagus in a boursin cheese sauce. Tossed with penne pasta. Sauteed sirloin tips with mushrooms and asparagus in a Gorgonzola (blue cheese) creme sauce. Tossed with penne pasta. Sauteed chicken with peas, mushrooms and prosciutto in a vodka creme sauce. Served over penne pasta. Chicken breast topped with prosciutto, mushrooms and mozzarella cheese in a Marsala wine sauce. Veal cutlet topped with prosciutto, mushrooms and mozzarella cheese in a Marsala wine sauce. Sauteed chicken in a lemon butter, white wine sauce with capers and mushrooms. Chicken tenders and jumbo shrimp sauteed in a garlic white wine sauce with prosciutto, asparagus and capers tossed with parmesan cheese and penne pasta. Sauteed sirloin tips with peppers and onions in a spicy marinara sauce.